Fonteo, in the municipality of Baleira, is, as its name indicates, a beginning. 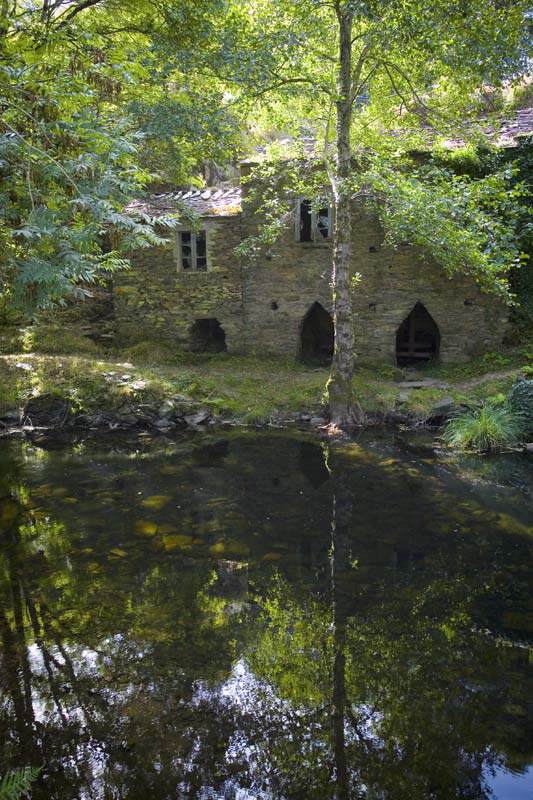 The Eo spring gathers up the waters from the mountain and begins a path of a little less than eighty kilometres to the Cantabrian Sea. Soon it will be surrounded by extensive oak woods and will receive water from other rivers. First the Rodil, that descends the hills of O Burón, the historic name of the area of A Fonsagrada; then the Turia, from the Asturian region of Los Oscos, which joins the Eo in A Pontenova. Then come the famous fishing grounds of Abres (Asturias). Footbridges and small bridges allow visitors to station themselves in the middle of the river and enjoy the appearance of the hemmed in river banks and pools. The salmon continues to be the king of the river. The daring journey through the ocean, some to the coasts of Canada and Greenland, to return to the sweet waters of its birthplace, involves an adventure in nature that the Cantabrian rivers transmit with all their might. The Eo takes part in this emotion. Liquid landscapes and a light that is especially sensitive to green tones. The final stage is a succession of meanders gradually subject to the influence of tides. 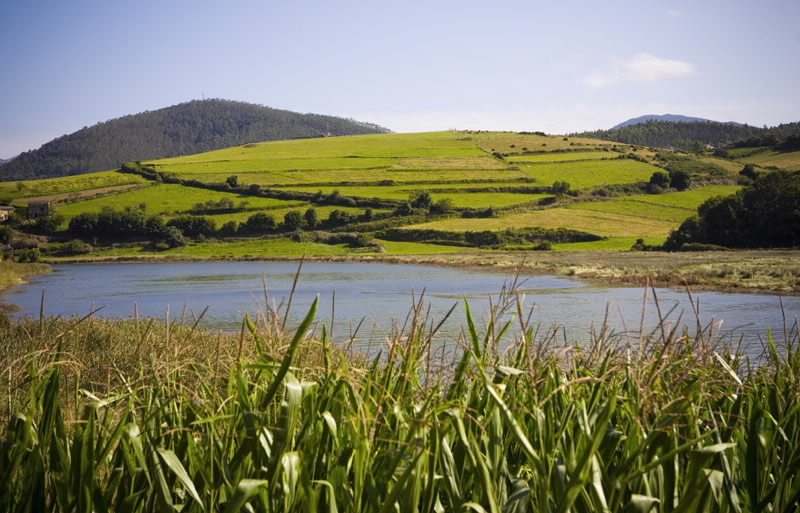 From A Veiga/Vegadeo the inundated valley becomes a great estuary with bulrushes where armies of anatidae and other birds find refuge during storms. Apart from the A-8 trans-Cantabrian highway, the main highways are the N-634 (A Coruña- Santander) road and the N-640 (Lugo-Oviedo). 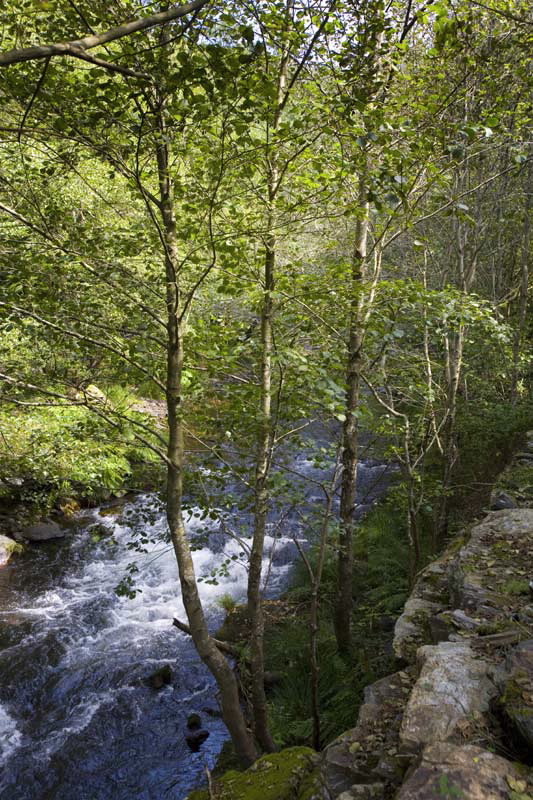 The LU-740 (A Fonsagrada-A Pontenova) road and the local road to Ribeira de Piquín on the N-640 (in A Pontenova) enable us to get closer to the upper course of the Eo and various tributaries. 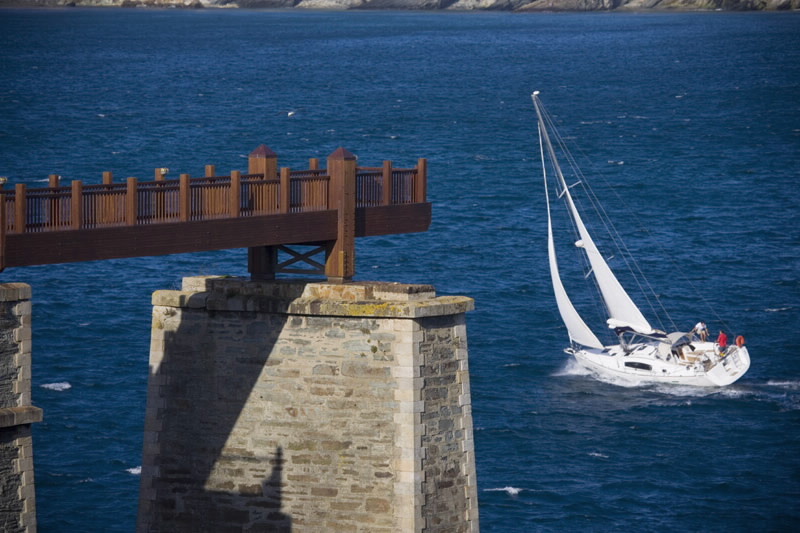 On the border of Galicia and the Principality of Asturias. 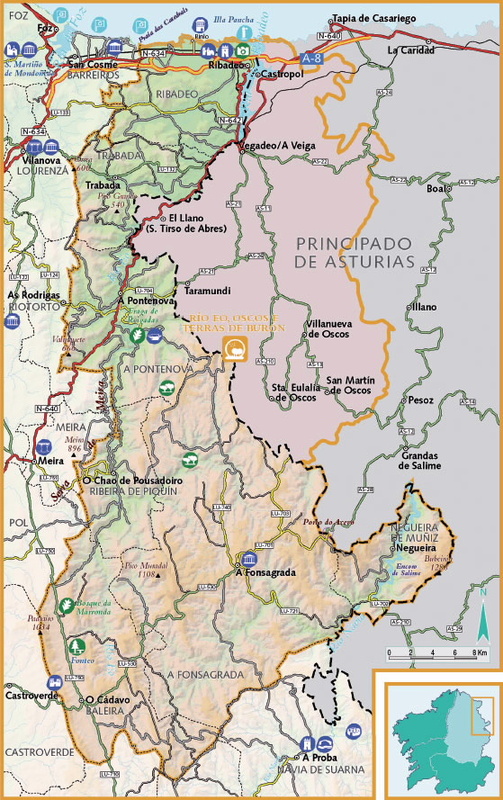 Seven Galician municipalities: Ribadeo, Trabada, A Pontenova, Ribeira de Piquín, Baleira, A Fonsagrada and Negueira de Muñiz; and seven Asturian: Castropol, Vegadeo, Taramundi, San Tirso de Abres, Villanueva de Oscos, Santa Eulalia de Oscos and San Martín de Oscos. 158,883 hectares of which 108,007 hectares are in Galicia. The Galician area of Ribadeo and the Asturian regions of Castropol and Vegadeo/A Veiga have the largest concentrations of population. 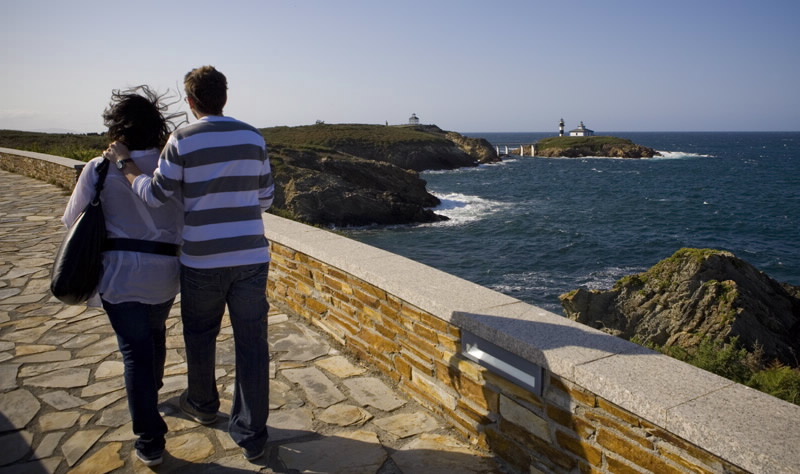 They are the points of access to tourist areas such as the coast and beaches also included in the Reserve (See Natural Monument A praia das Catedrais). There are two excellent ways to get to know the scenic variety of the zone. One is to travel the Vía Verde del Eo (Green Route of the Eo) which reclaimed eleven kilometres of the historical train route linked to the iron mines. The starng point of the route is at the foot of the old chimneys of the A Pontenova ovens. 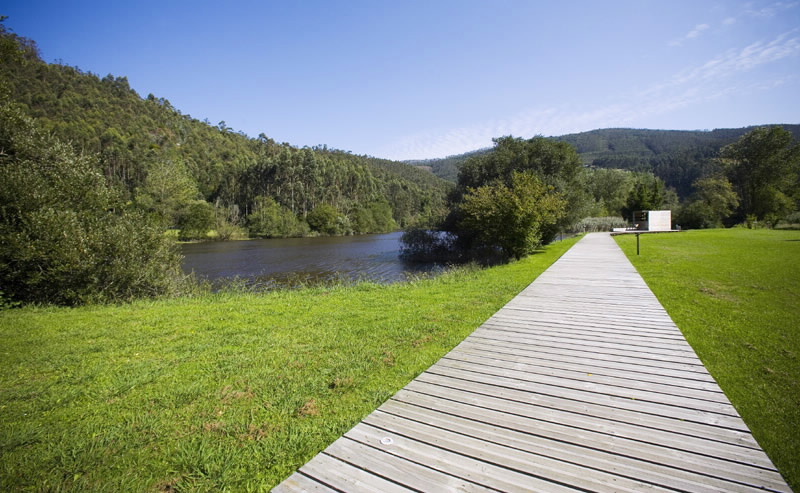 In order to run alongside the river various damp tunnels and suspension bridges must be crossed to reach O Cairo, where the Eo starts hurrying to reach San Tirso de Abres, goal of the Green Route. The iron train’s importance revives in Ribadeo, restoring the ancient route to O Cargadoiro, close to the fortress of San Damián. All in a marime walk to the end of the island of Panchas.